More great photos of the first SyAAF's aircraft I could put my hands on. A frontal shot for a SyAAF Piper Cub with a group of the first Syrian pilots. Another shot for the same from the side. The red-arrow-pointed out pilot is the Syrian hero AbdulKareem Qatma. 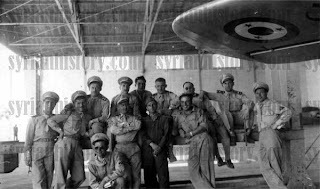 Pilots, airmen and ground staff gathering in a hangar (could be in Mazze AFB), the edge of a wing belong to a SyAAF Piper Cub. 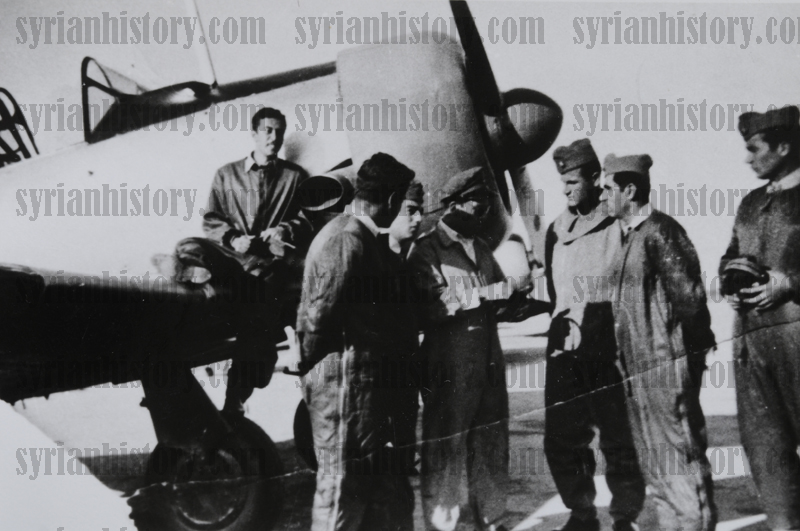 A photo belongs to 1954 shows a group of Syrian pilots gathering infront of a SyAAF Harvard Mk.II. Yahya Al Ghazzi, another Syrian pilot standing infront of a Harvard Mk.II as well. SyAAF airmen gathering infront of what it looks like a De Havilland Chipmunk. At the end, a photo is taken for SyAAF units during an air force parade forming the word سوريا (Syria) in 1955. 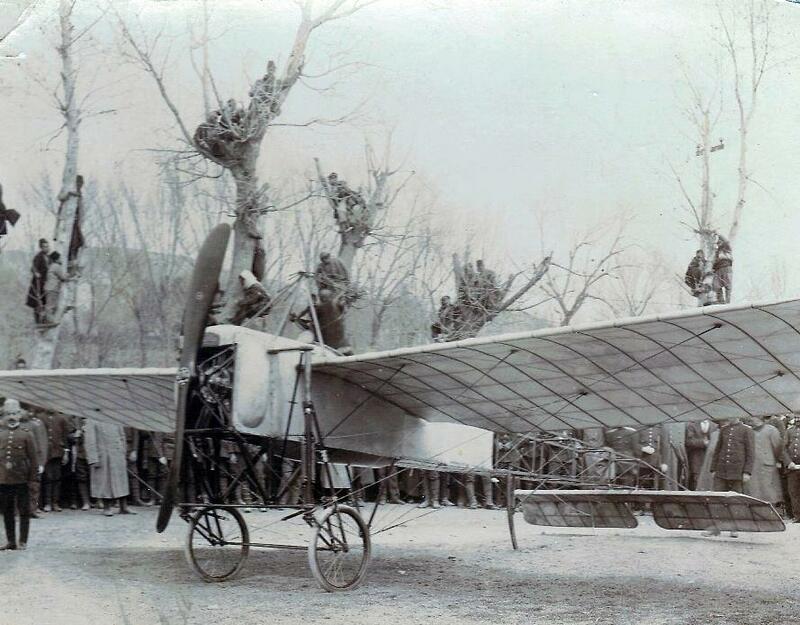 Apparently, there are two types of aircraft here. 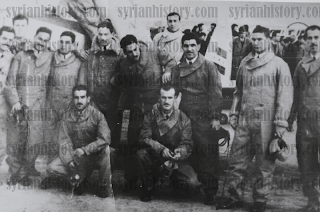 Since 1970, the word أسد "Assad" has been added to be formed as well during the parade of the graduation of airmen !! On Tuesday's morning on 6 August 2013 and after almost ten months of besieging, FSyA (consisting of various battalions and brigades) could conquer the regime's last castle in the far north of Aleppo's county. 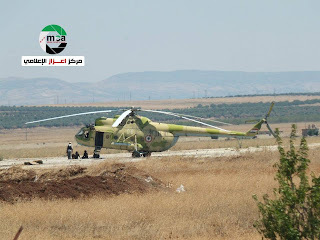 This achievement could be considered one of the biggest in this month, considering that this military base has been converted from an airfield to a spot where all remaining regime's units of the northern county of Aleppo have gathered in, showing a huge resistance to the continues FSyA's trials to invade it. 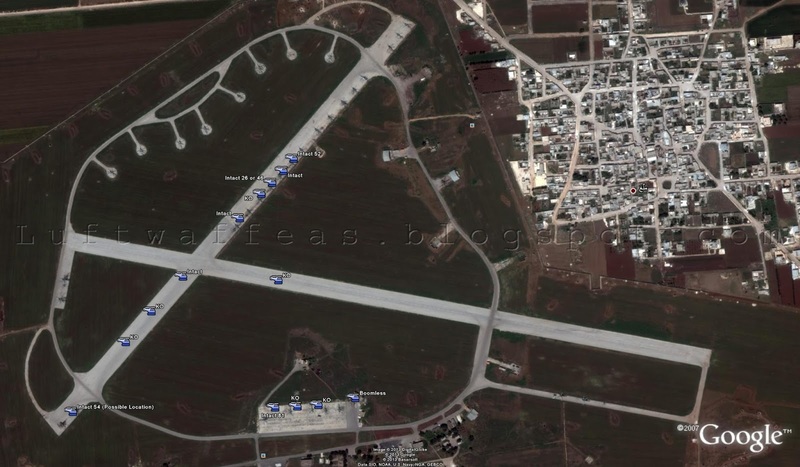 Filtrating this spot, will allow now some units those are highly experienced in besieging air force bases, to be dispatched to Kweres AFB. 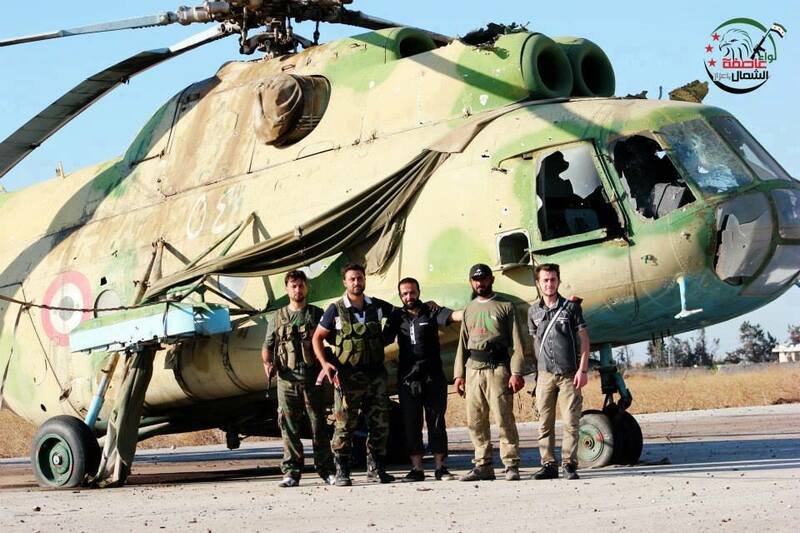 Above, FSyA units standing in front of Mi-8 with serial 54. Mennegh or Mennekh airbase, which is around 32Km to the north of Aleppo city, and just 12Km far from the nearest Syrian/Turkish border point, was one of the major training air bases in Syria since the formation of the SyAAF. Until late 1990's it was -beside the helicopters- the home base of MBB 223 Flamingo's. 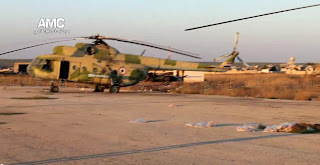 Also, the PAC Mushshak's were based there when they were first delivered to SyAAF before shifting them to Kweres airbase. 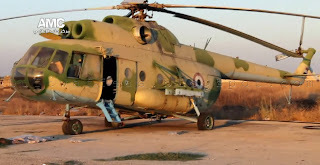 Well, for better understanding, I have prepared this key plan in order to locate and count the remaining Mi-8's in this base (note that all helo's here are Mi-8's, no Mi-17's at all). 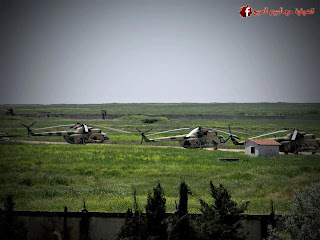 Referring to the footage of various videos and photographs, I could count 14 Mi-8's in this base, among them, there are 7 units let's say they are 'Intact'. Intact here, means the fuselage is kinda safe, there could be some broken glass, bullets penetrated the fuselage, but overall, the helicopter overall still might be overhauled (extreme overhaul would be required here). 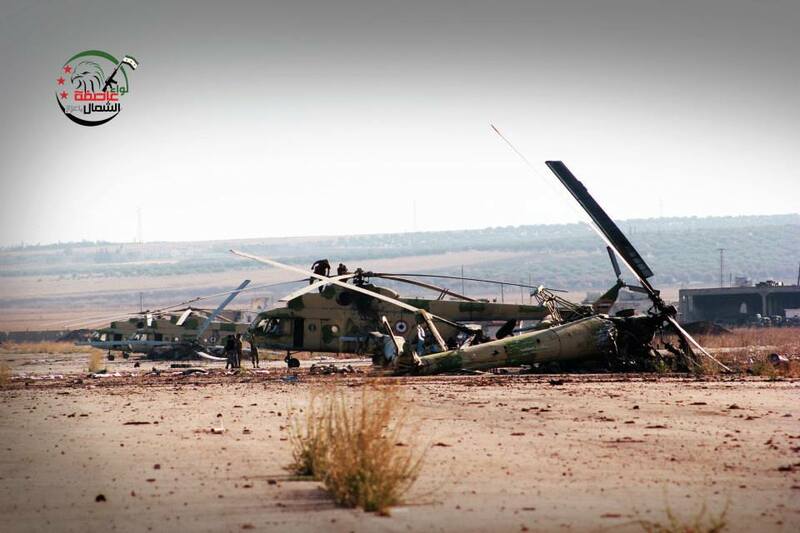 Aside those, there are 6 Mi-8's completely Knocked-Out, while only one left boom-less. 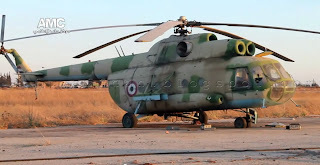 Starting our photo tour with the Mi-8 with serial 54, that one was seen in some videos being inspected by FSyA units, also being played with as a 'BUS' !! Another shot for the same. 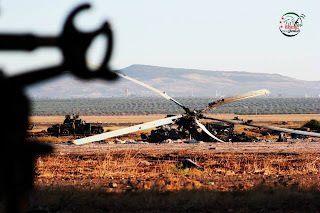 In this pre-final-attack photo, the Mi-8 with serial 54 is seen at the background, while we can read the serial 52 in white written on the first one. 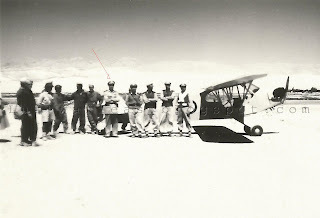 Photo for the one with serial 52 from the opposite side. 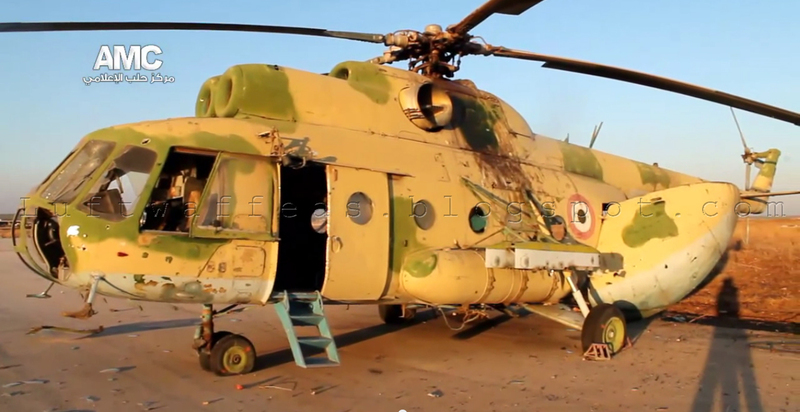 Referring to the 'Key Plan' map, there is another 'Intact' Mi-8 to the next of the one with serial 52. 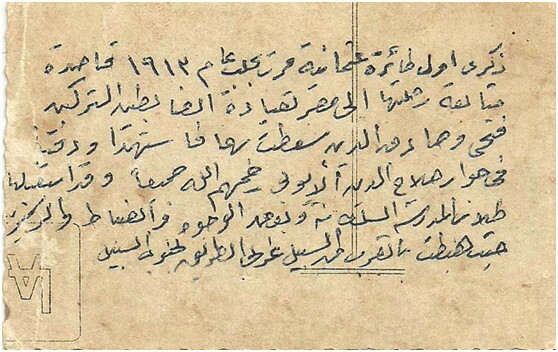 Unfortunately, the serial is not readable at all here. 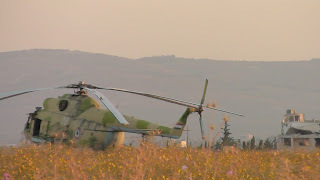 The third Mi-8 after those two, carries the serial 26 or 46 (I believe it is 46 more). The most important Mi-8 in this airbase, is the one with serial 81 (1281). This was the private helicopter of the commander of Mennegh air base, the brigadier-general Ali Salim Mahmoud. Here is a photo for the same been taken before overriding the base. 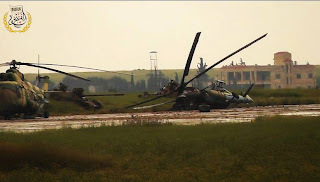 The same Mi-8 can be seen here to the right. 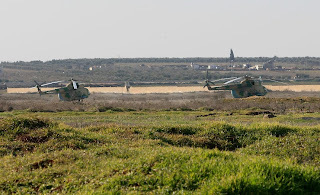 In this photo we can see as well two knocked-out Mi-8's, one beside the intact one in the main tarmac infront of the airbase headquarter, the second is on a runway (as stipulated in the key map). 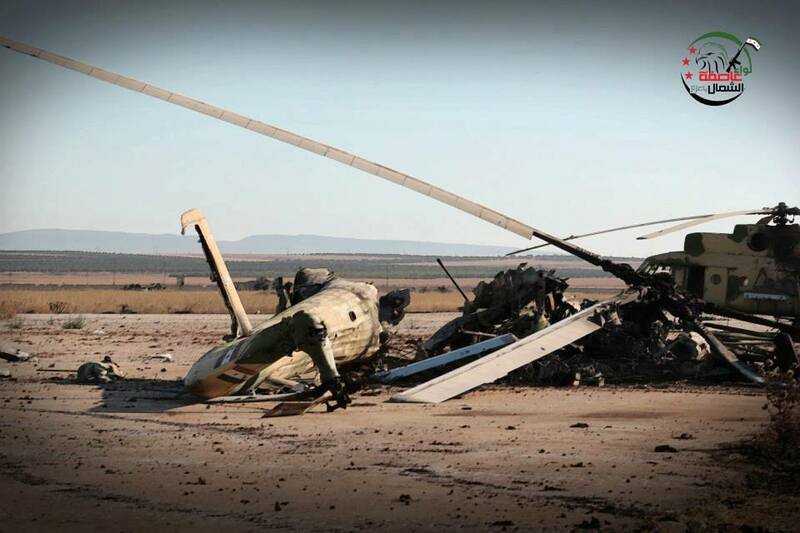 Closer photo for the Mi-8 damaged on the main tarmac. In this photo, we can see a line of Mi-8's (some are still intact) on the SW/NE runway. 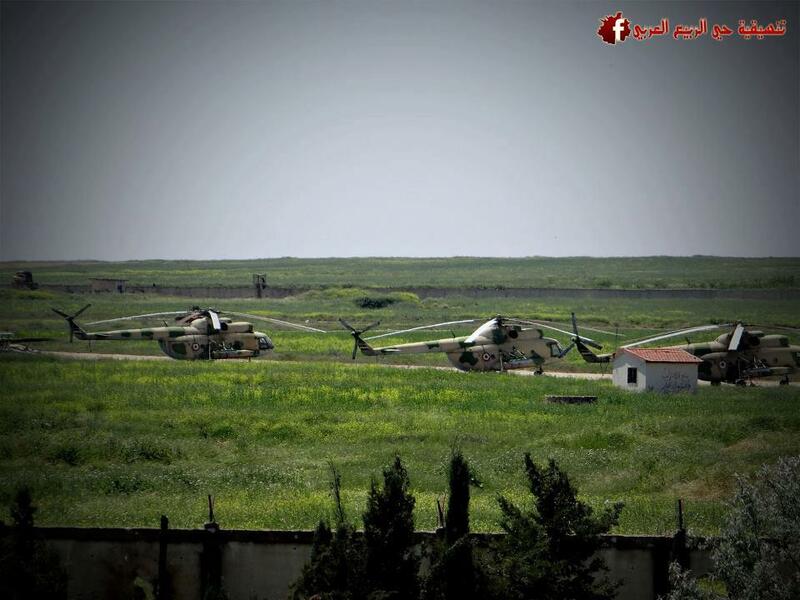 A pre-override photo shows the Mi-8's with serials 52, unknown, 46 (from right to left). 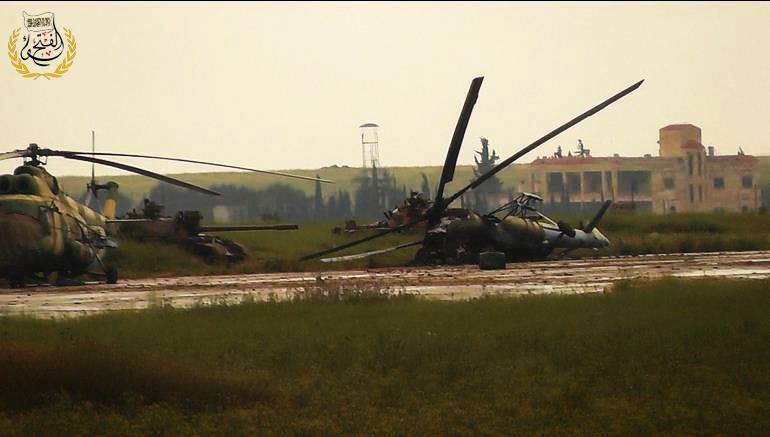 Another pre-override shot for three Mi-8's. Another photo here shows the Mi-8 with serial 26 to the right. 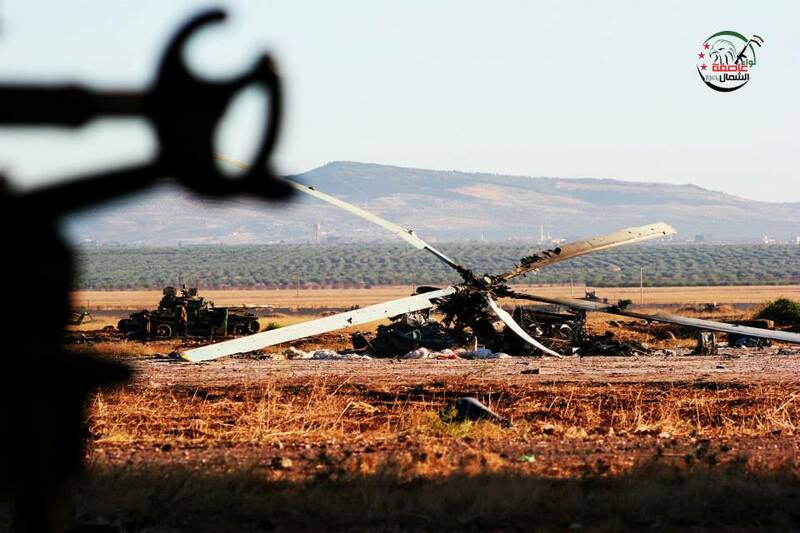 One of the knocked out Mi-8's. Another knocked out Mi-8 side by side to an intact one, this is a pre-override photo. 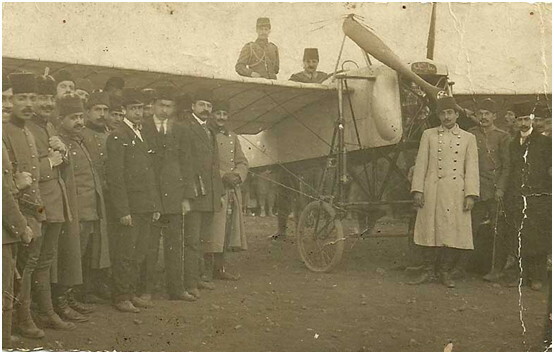 A better photograph for the ever first aircraft flew over Syria in 1913, it shows better details of the airframe and stipulates how light it is. 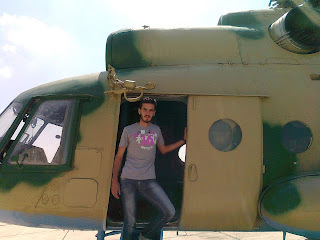 It was securely guarded to prevent people reaching it those want to examine and acquire some parts as souvenir !! A post card with the aircraft photographed in 1913 in Aleppo city surrounded by the students of 'Sultaniyah' school of Aleppo, officers and some VIPs. 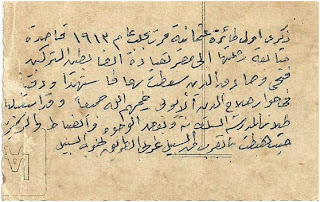 What is written at the back of the card: "The reminiscence of the first Ottoman passed by Aleppo in 1913 continuing its trip to Egypt piloted by the Turkish officers Fathi and Sadiq Addin which fell down, the martyrs were buried in the neighborhood of Salahuddin Al Ayoubi -May God have mercy on all-. 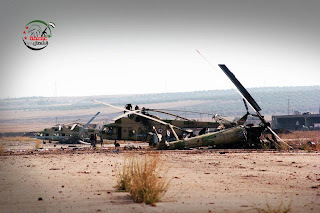 It was received by the students of 'Sultaniyah' school and some VIPs and officers and officials when landed near Al Sabeel to the west of Al Sabeel southern road"
Sorry for not posting here as I was over busy and away from my blog for a while, although I have dozens of new photos for SyAAF and REAF units waiting on queue to be published soon. During this period I have discovered an optimum game for those who are not willing to spend half an hour to setup and load a simulation PC game. 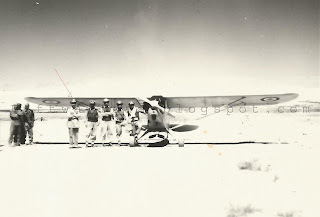 Actually it is an iPad game, needs few seconds to start up, to choose your aircraft and DOGFIGHT !! 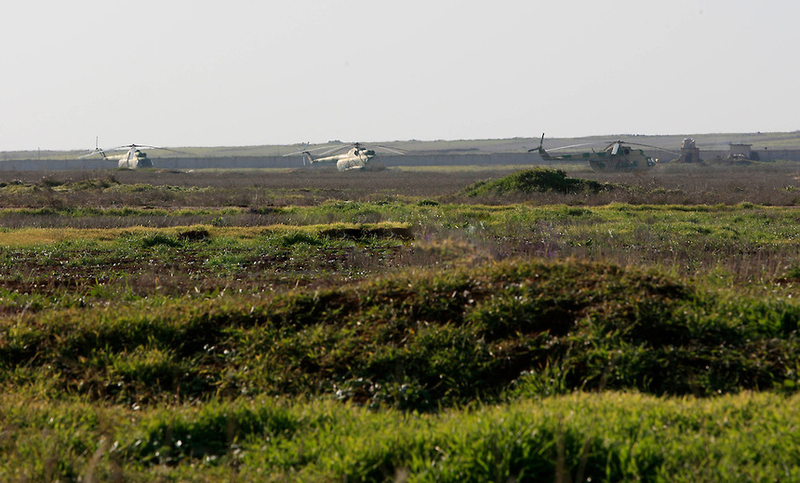 Above, a SyAAF MiG-21bis engages a IAF F-4 Phantom II, a seconds before hitting it with an AA-8 Aphid. 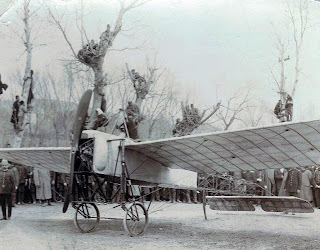 What makes this game special, is the fine details of the 3D aircraft in addition to the camo which is mostly accurate. 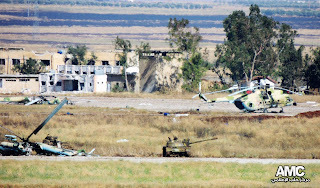 SyAAF MiG-17F chasing an IAF Mystere IVA. 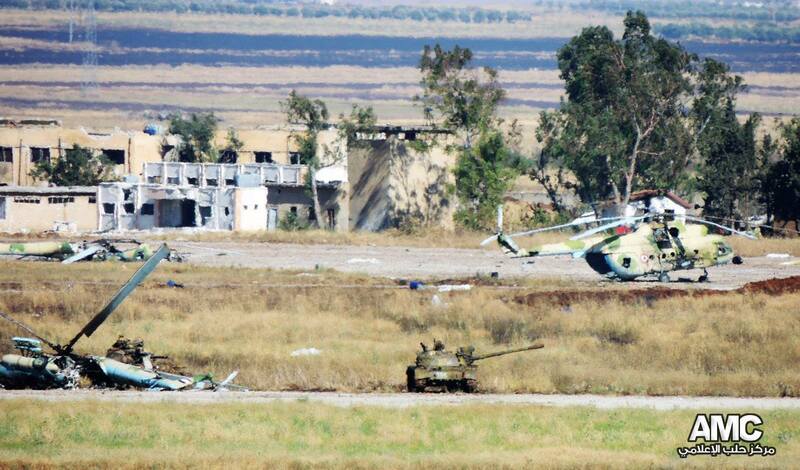 SyAAF MiG-23MLD fires an R-23 (AA-7 Apex) on a pair of opponent enemy aircraft. 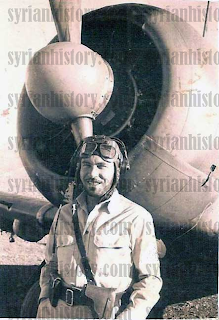 Although it is a ground-attack aircraft, but I would not waste any chance to fly the SyAAF Su-7BMK in dog-fighting sorties. 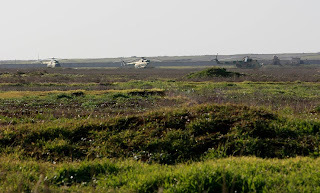 The camo of the SyAAF Meteor is wonderful and one of the most accurate one among many aircraft in this game, here it is firing on an IAF Spitfire Mk.IXe. Guys, I strongly advise everyone here to download this game, if you do not have an iPad yet, get one immediately, you will enjoy it, I'm sure of that, not to forget that you will enjoy playing the main game 'Strike Fighters' which contains much more types of eastern and western manufacturers.